Nakizumo is an annual baby crying contest that takes place at the Sensoji Temple at Asakusa. A hysterically wailing baby is the last thing any mother wants. Between the screeches of blue murder, the only thing a desperate mother can do is take a deep breath, cover her ears and pray that her baby stops. Well, in Tokyo, Japan, doting mums and dads spend one day of the year hoping and praying for the total opposite: please, please be a cry-baby today! This year, 160 babies born in 2016 participated in the event, which took place at the end of April. 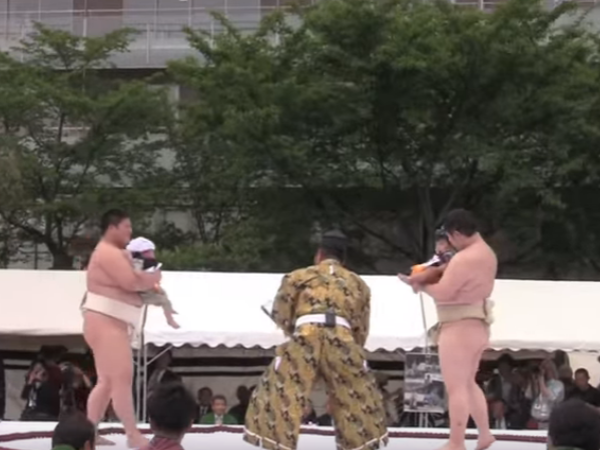 The competition involves amateur sumo wrestlers, who each hold a baby in a ring. Two wrestlers at a time partake in the standoff, which sees the baby’s tickled, gently shaken and shown scary masks, all in a bid to make the tiny tots cry. But that’s not all: a referee even stands in the ring to preside over the ‘game’. The competition is taken seriously, though, as the winning baby is honoured with the title of healthiest baby and, according to tradition, will have a long, active life. With such a strong pair of lungs, it’s not hard to imagine why.